Banerjee, S., Zamocky, M., Furtmuller, P.G., Obinger, C.
Probing the two-domain structure of homodimeric prokaryotic and eukaryotic catalase-peroxidases. Bauerova-Hlinkova, V., Hostinova, E., Gasperik, J., Beck, K.F., Borko, L., Lai, A.F., Zahradnikova, A., Sevcik, J.
Bioinformatic mapping and production of recombinant N-terminal domains of human cardiac ryanodine receptor 2. Bielikova, M., Pangallo, D., Turna, J.
Polymerase chain reaction - restriction fragment length polymorphism (PCR-RFLP) as a molecular discrimination tool for raw and heat-treated game and domestic animal meats. New criterion for evaluation of honey: quantification of royal jelly protein apalbumin 1 in honey by ELISA. Brezna, B., Zenisova, K., Chovanova, K., Chebenova, V., Krakova, L., Kuchta, T., Pangallo, D.
Evaluation of fungal and yeast diversity in Slovakian wine-related microbial communities. Brindza, J., Grof, J., Bacigalova, K., Ferianc, P., Toth, D.
Pollen microbial colonization and food safety. Buckova, M., Godocikova, J., Zamocky, M., Polek, B. Screening of bacterial isolates from polluted soils exhibiting catalase and peroxidase activity and diversity of their responses to oxidative stress. Isolates of Comamonas spp. exhibiting catalase and peroxidase activities and diversity of their responses to oxidative stress. Chebenova, V., Bertaova, G., Kuchta, T., Brezna, B., Pangallo, D.
Randomly-Amplified Microsatellite Polymorphism for Preliminary Typing of Lactic Acid Bacteria from Bryndza Cheese. Godocikova, J., Zamocky, M., Buckova, M., Obinger, C., Polek, B.
Molecular diversity of katG genes in the soil bacteria Comamonas. Halgasova, N., Ugorcakova, J., Gerova, M., Timko, J., Bukovska, G.
Isolation and characterization of bacteriophage BP from Paenibacillus polymyxa CCM 7400. Hlinkova, E., Bobak, M., Bauerova-Hlinkova, V., Raffay, J. Some genetic, biochemical and morphological analysis of selected powdery mildew strains at the beginning of sporulation on barley . Homerova, D., Rezuchova, B., Skovierova, H., Kormanec, J. The expression of the rpoE operon is fine-tuned by the internal rseAp promoter in Salmonella enterica serovar Typhimurium. Yeast glucoamylases: molecular-genetic and structural characterization . 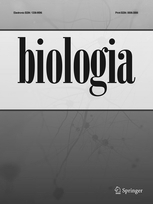 Klucar, L., Stano, M., Hajduk, M.
phiSITE: database of gene regulation in bacteriophages. Majtan, J., Kumar, P., Majtan, T., Walls, A.F., Klaudiny, J. Effect of honey and its major royal jelly protein 1 on cytokine and MMP-9 mRNA transcripts in human keratinocytes. Majtan, T., Liu, L., Carpenter, J.F., Kraus, J.P. Rescue of Cystathionine -Synthase (CBS) Mutants with Chemical Chaperones PURIFICATION AND CHARACTERIZATION OF EIGHT CBS MUTANT ENZYMES. Majtanova, L., Majtan, T., Majtan, V.
Detection of the Class 1 Integrons and SGI1 among Salmonella enterica Serovar Typhimurium DT104, U302, DT120, DT193, and Nontypable Human Isolates. Maruna, M., Sturdikova, M., Liptaj, T., Godany, A., Muckova, M., Certik, M., Pronayova, N., Proksa, B. Isolation, structure elucidation and biological activity of angucycline antibiotics from an epiphytic yew streptomycete. Nagyova, V., Nagy, A., Timko, J.
Morphological, physiological and molecular biological characterisation of isolates from first cases of Acanthamoeba keratitis in Slovakia. Nagyova, V., Nagy, A., Janecek, S., Timko, J.
Morphological, physiological, molecular and phylogenetic characterization of new environmental isolates of Acanthamoeba spp. from the region of Bratislava, Slovakia. Novakova, R., Odnogova, Z., Kutas, P., Feckova, L., Kormanec, J. Identification and characterization of an indigoidine-like gene for a blue pigment biosynthesis in Streptomyces aureofaciens CCM 3239. Novakova, R., Kutas, P., Feckova, L., Kormanec, J. The role of the TetR-family transcriptional regulator Aur1R in negative regulation of the auricin gene cluster in Streptomyces aureofaciens CCM 3239. Pangallo, D., Chovanova, K., Makova, A. Identification of animal skin of historical parchments by polymerase chain reaction (PCR)-based methods. Seo, E., Andersen, J.M., Nielsen, M.M., Vester-Christensen, M.B., Christiansen, C., Janecek, S., Motyan, J.A., Janecek, S., Haser, R., Glaring, M.A., Blennow, A., Kandra, L., Gyemant, G., Aghajari, N., Abou Hachem, M. et al. New insight into structure/function relationships in plant alpha-amylase family GH13 members. Flexibility observed in high resolution structures of Streptomyces aureofaciens ribonucleases determined by diffraction methods . Sevcikova, B., Rezuchova, B., Homerova, D., Kormanec, J. The Anti-Anti-Sigma Factor BldG Is Involved in Activation of the Stress Response Sigma Factor SigH in Streptomyces coelicolor A3(2). Skrabana, R., Dvorsky, R., Sevcik, J., Novak, M.
Monoclonal antibody MN423 as a stable mold facilitates structure determination of disordered tau protein . Smidak, R., Kralovicova, M., Sevcikova, B., Jakubcová, M., Kormanec, J., Timko, J., Turna, J.
Sequence analysis and gene amplification study of the penicillin biosynthesis gene cluster from different strains of Penicillium chrysogenum. Smidak, R., Jopcik, M., Kralovicova, M., Gajdosikova, J., Kormanec, J., Timko, J., Turna, J. Core Promoters of the Penicillin Biosynthesis Genes and Quantitative RT-PCR Analysis of These Genes in High and Low Production Strain of Penicillium chrysogenum. Vlasits, J., Jakopitsch, C., Bernroitner, M., Zamocky, M., Furtmuller, P.G., Obinger, C.
Evolution of structure and function of Class I peroxidases.